Thank you for choosing Sarnoff Artist Materials. Henry Sarnoff started his career in Art working as an Assistant Printmaker for the family business as a pre-teenager in Los Angeles, California. Southern California proved an excellent training ground for Henry to learn the Art business. He went on to work at one of the oldest and largest art material importers in the country. Henry’s wife has family from the Tucson area and one look at the beautiful Sonora Desert and Tucson’s lifestyle was enough to inspire the Arizona move. Henry fulfilled a lifelong dream and opened a 500 square foot store in Tucson called Sarnoff Artist Materials. It was 1993 and Henry ran the business by himself. From the very beginning, Henry Sarnoff offered Tucson Artists the best in service and selection. The store has always been staffed by Artists who can both speak the Creative Professional’s language or help the student find his voice. Today, Sarnoff Artist Materials is 4,000 square feet and is staffed by 8 gifted and professional employees. 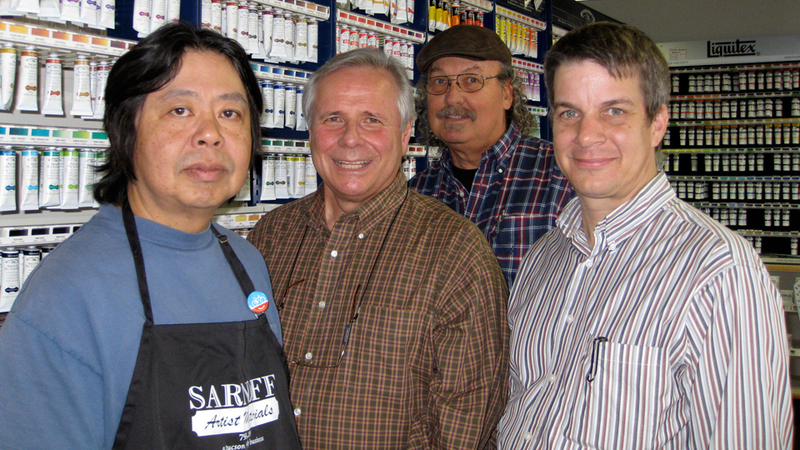 Sarnoff’s is one of the nation’s best Art Stores with loyal online customers here and overseas. If you create Art for its own sake; if your works are found in museums and private collections; whether you are a Professional Architect, Graphic Artist, a dreamer, or a student, Sarnoff’s has everything that you need and the experts to help you create and present your ideas in the best way possible. Sarnoff Artist Materials is Tucson’s award-winning destination for creative supplies. Here are classic art supplies, architectural equipment, furniture, art books, stationery, and fine pens. You can visit our beautiful Tucson store or browse our easy-to-navigate website. Now buying the World’s best Art Supplies has never been easier. Sarnoff’s staff is like family. They are friendly, experienced, and knowledgeable in both classic and cutting-edge mediums and techniques. Sarnoff Artist Materials now features a technologically advanced, museum caliber, custom Framing Department where you can choose from more than a thousand distinctive picture frame styles. Now you can display your work or a prized painting in the best way possible. Sarnoff Artist Materials recently added state of the art, digital printing capability with potential to reproduce a 60” image on canvas or museum quality papers. This gives Sarnoff’s the best Fine Art Reproduction capability in the State. You’ll enjoy shopping at Sarnoff’s for your creative needs because it takes an Artist to know an Artist’s needs. We are looking forward to helping you soon.